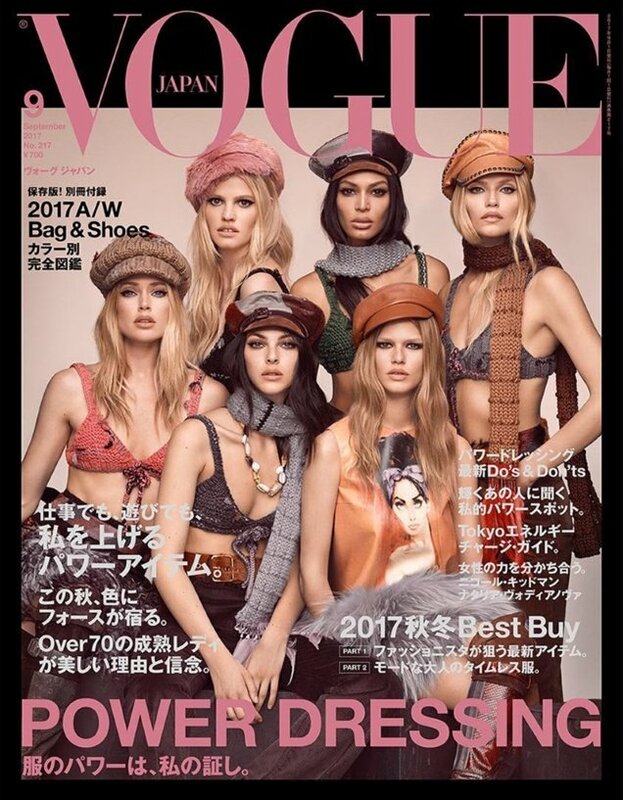 Last month, our forums lost it over Vogue Japan’s embarrassingly overcrowded August cover, featuring 67 Dolce & Gabbana-clad models. Moving on from that mess, the glossy has pared it down to just a handful (six) of the industry’s top models to front the all-important September 2017 cover. Luigi & Iango captured Lara Stone, Joan Smalls, Natasha Poly, Doutzen Kroes, Vittoria Ceretti and Anna Ewers for the group cover image, with Anna Dello Russo styling the girls in head-to-toe Prada. Was it enough to win over our opinionated forum members? “Absolutely gorgeous! Fabulous styling! I will be splurging on this!” declared an overjoyed GivenchyHomme upon seeing the cover. “Stunning cover. Pure perfection,” applauded fashionlover2001. However, the cover wasn’t catering to everyone’s taste. “I hate this. It’s so cheesy. Every girl looks like plastic surgery victim with that makeup and Photoshopping. Everything about it feels so cheap,” slammed dior_couture1245. “They all look dead in the face. I’m probably in the minority, but I believe the covers of Vogue China, India, and Japan should always be dominated by Asian models,” critiqued mepps. “I’m not a fan. First of all not a fan of the extreme retouching and second, not of the cast,” anlabe32 disapproved. “What a horrible cover! Yuck at them all looking this plastic and generic! !” exclaimed a horrified Miss Dalloway. Are you feeling it? See what else the issue has to offer and join the conversation here.